These old fashioned English trifle recipes are so easy to make, yet your finished dessert will look elaborate and taste as though you've spent hours in the kitchen. You simply must make a one for your next party or get-together. A dessert this popular for centuries has to be good. Fill a glass bowl with a layer of sliced sponge cake. Cover with red currant jelly or raspberry jam, then add more cake slices. Sprinkle over this a handful of shredded coconut and 1/2 cup chopped nuts of choice. Pour over all a custard made of 1 pint milk, 2 eggs, 2 tablespoonfuls sugar. Boil custard until it thickens, and add a pinch of salt and vanilla to taste. When cold serve with whipped cream. —N. Hampson, Mount Forest, Ont. Arrange 1/2-inch slices of sponge roll in bottom of dish, and drizzle sherry over them. Open tin of fruit, reserving syrup. Arrange fruit evenly over sponge slices, then make Jello, using syrup as part of liquid called for. Pour Jello mixture gently over fruit and allow to cool. Make custard (see custard instructions in above recipe) and while warm, spread on Jello. Top with whipped cream and decorate with fresh fruit slices. Place several alternate layers of Savoy Biscuit and bitter almond Macaroons in a handsome glass bowl, or dish, and saturate them with the best Madeira wine; cover the surface of the top layer with any kind of jelly, jam, or marmalade (red currant jelly is generally preferred); then take the whites of four eggs, half a pound of pulverized loaf sugar, the juice of one sound lemon, a little rose water, and one pint of cream; whisk all to a froth, and put lightly into the bowl, in the shape of a cone; and ornament according to fancy, with colored sugars. Take a deep, glass dish, lay the bottom closely with slices of cold pound cake, or sponge cake, either will do, then pour on a quart of wine, fill the top with rich float or whip; ornament with preserves, cut in delicate bits. 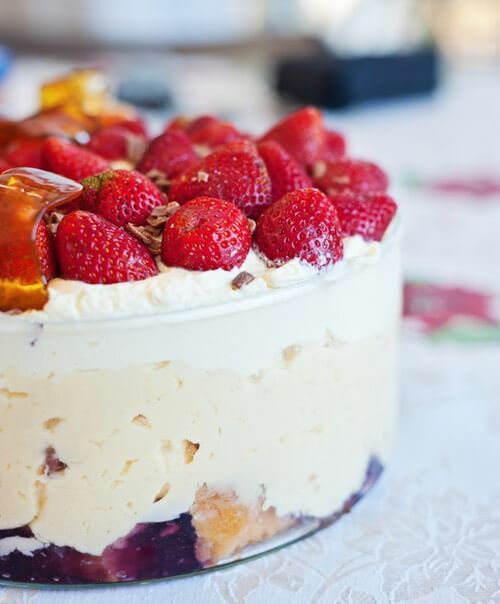 Trifles first appeared around 1596, and they've seen very little change since the 1700s. 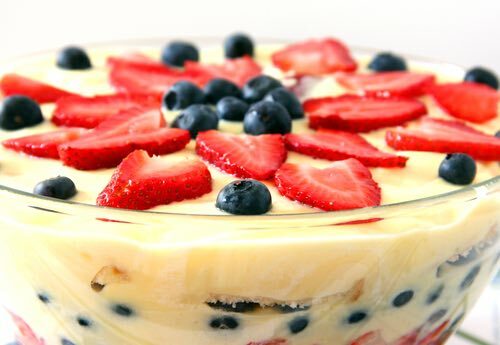 It's a very popular pudding-like dessert consisting of layers of sponge cake or macaroons soaked in wine and placed in a large bowl, then covered with a rich egg custard and often topped off with freshly whipped cream. Sometimes colorful layers of fresh or preserved fruits are added.